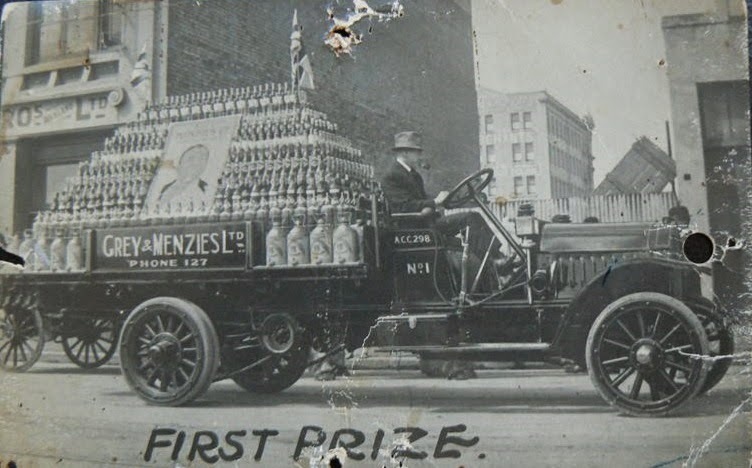 A postcard for-sale online shows what appears to be a display/float for a parade, that was entered by Grey & Menzies Ltd. The title FIRST PRIZE marked on the card. 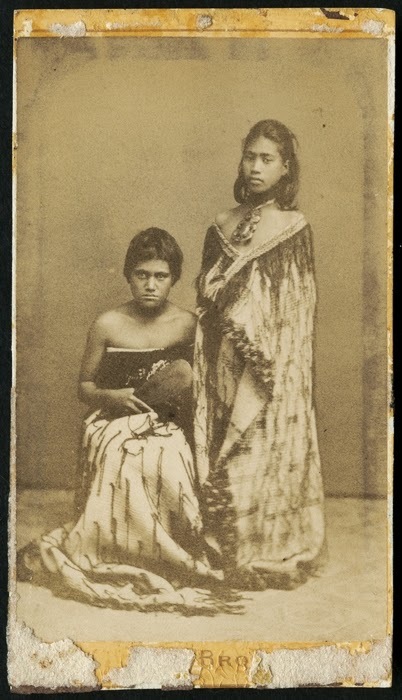 The location possibly Auckland. Thames and area were famous for the quality of many of their early cordials and soft drinks. Whether it was from confectioners such as Charles Palmer, Butement Brothers or Ballens. Menzies, later Grey & Menzies a name well known and remembered by many Thames Valley residents today. 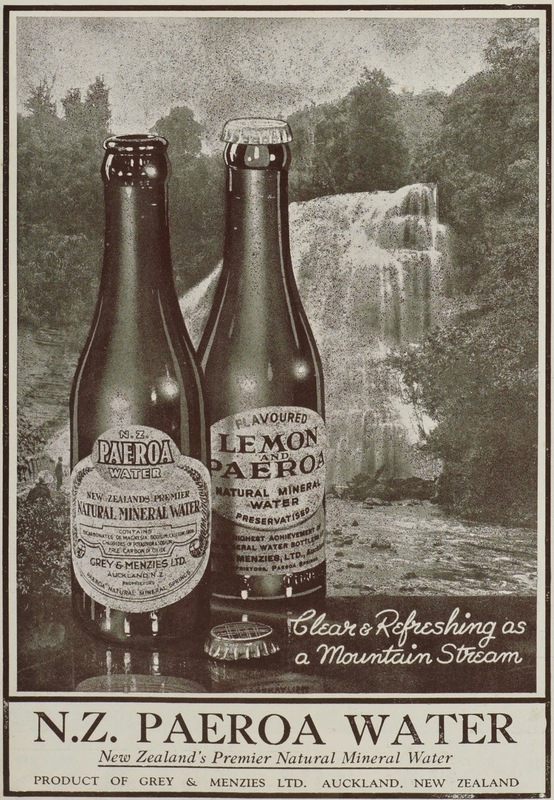 Known for the famous 'Lemon & Paeroa' drink. The commemorations for WWI will be covered over the months to come. Today plays an important part in the lead-up to World War One. One years ago Archduke Franz Ferdinand and his wife were assassinated. The Thames Star Newspaper reported the event on 29 June 1914. 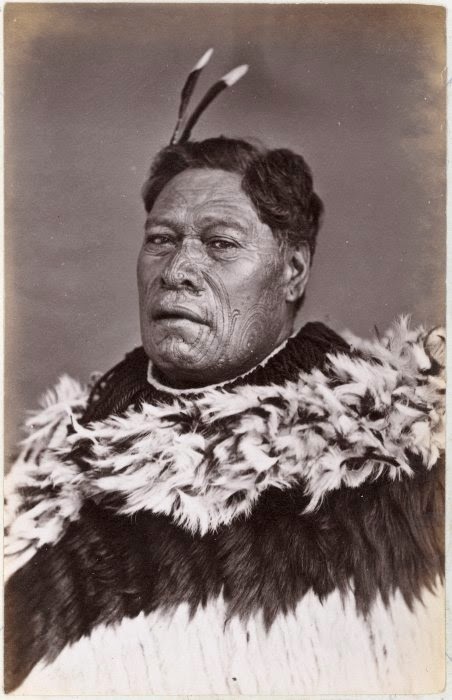 In the early photographs of Thames during the post goldfield invasion, there are few named photographs of the local iwi. The people who owned the land and had settled in the district for hundreds of years just do not feature in the early photographic records of miners, shopkeepers and local groups. The one exception being the Taipari family. What we do have though is a large number of unnamed portraits taken by the Foy Bros of Pollen Street Thames. Sadly these are not named. 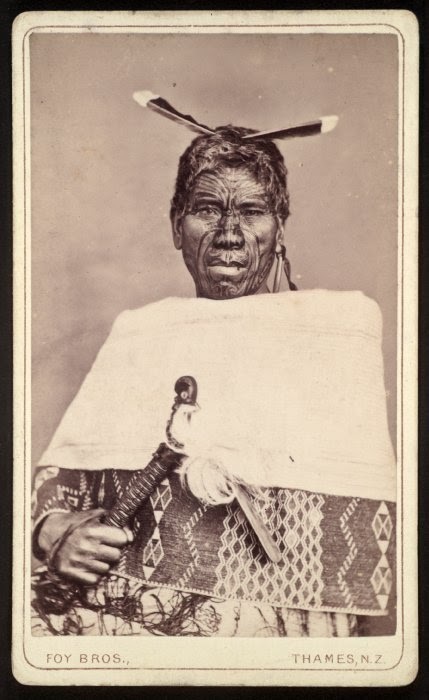 These Maori postcards were very popular in the late 19th Century, in particular to send back to England to family back at home. 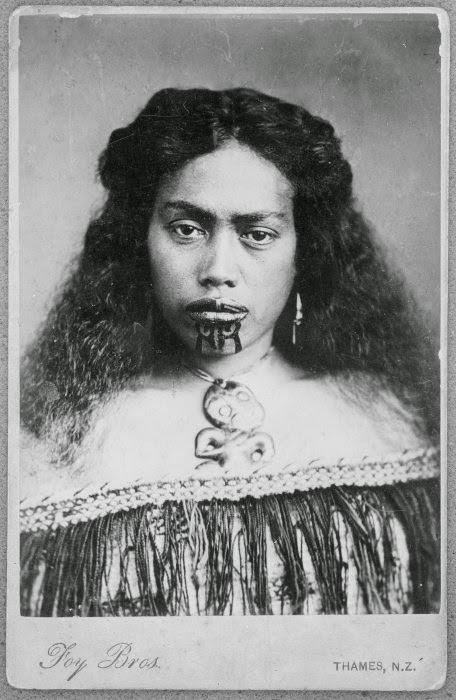 The Foy Bros weren't the only photographers in Thames who sold postcards that included Maori portraits. The Frith Portrait rooms next to Dr Kilgours in Pollen Street, in 1876 had a wide selection for sale. 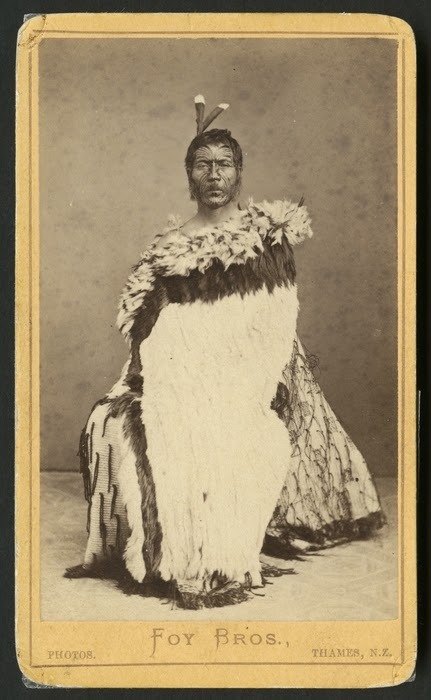 An example of a Foy Bros specimen sheet available for viewing at the online Te Papa Collection, Wellington. Others are available via the Alexander Turnbull Collection. 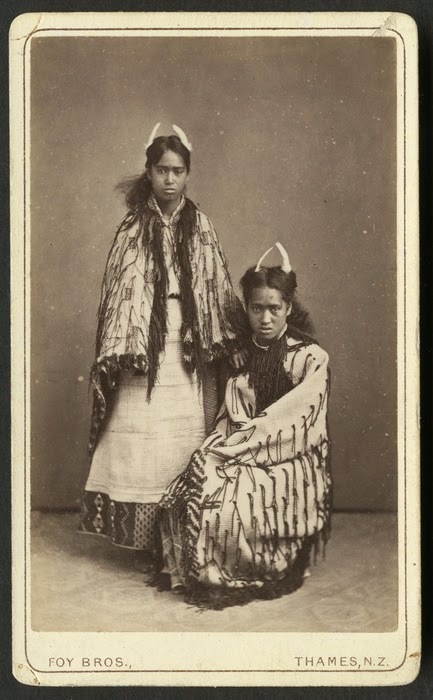 On the left is Tamati Waka Te Puhi and on the right Rena Punehu. There are many others that haven't been identified. If you have copies of any, The Treasury always welcomes donations of images and any information you have on those people in the photograph. Who are they? What iwi did they belong to? Any descendants? A previous post of an early view of Shortland, Thames, showed a large built up area from Mary Street South. There was a wide discrepancy in homes - ranging from tents, huts, cottages to very developed lots. 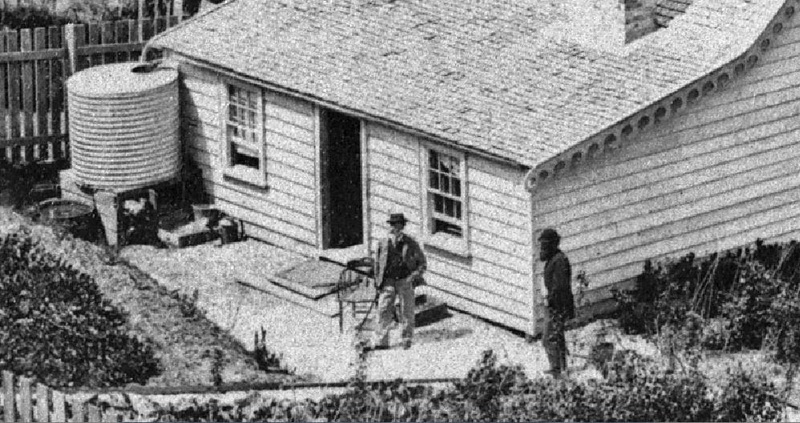 A higher definition photo shows that this house below, that was in the vicinity of Broad Street/Upper Albert Street in Grahamstown belonged to a wealthy, established early settler. Who could the owner be? A mine owner/manager? Or perhaps an owner of a large business? In 1939, Bowen Street was the section of road leading from the Hape Creek to south of Banks Street. Today it is known as Rolleston Street. World War Two had started and the posties would have been busy delivering letters around the town from their men overseas. 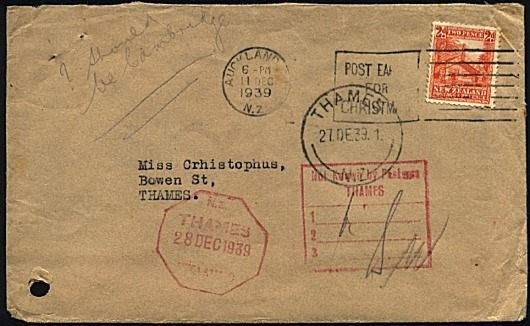 Amongst the letters was this one sent from Auckland on 11 December 1939 to Miss Christophus (Crhristophus) of Bowen Street, Thames. The post office tried to deliver it, but eventually on the 27/28 December appear to have returned the letter. The mystery never solved of who Miss Christophus was. Even with all the resources available today this appears still to be a 'brick wall' as to who this lady was. A possible conclusion being that the surname was changed, but many derivations exist. There were a few men by this name in the South Island during the early gold rushes, but they too may have changed their name to perhaps Christopher, Christoff and so on. Directories, newspapers, electoral rolls to date hold no clues. Do you know who Miss Christophus was? The 6th June 2014, is the 70th Anniversary of D Day WWII. 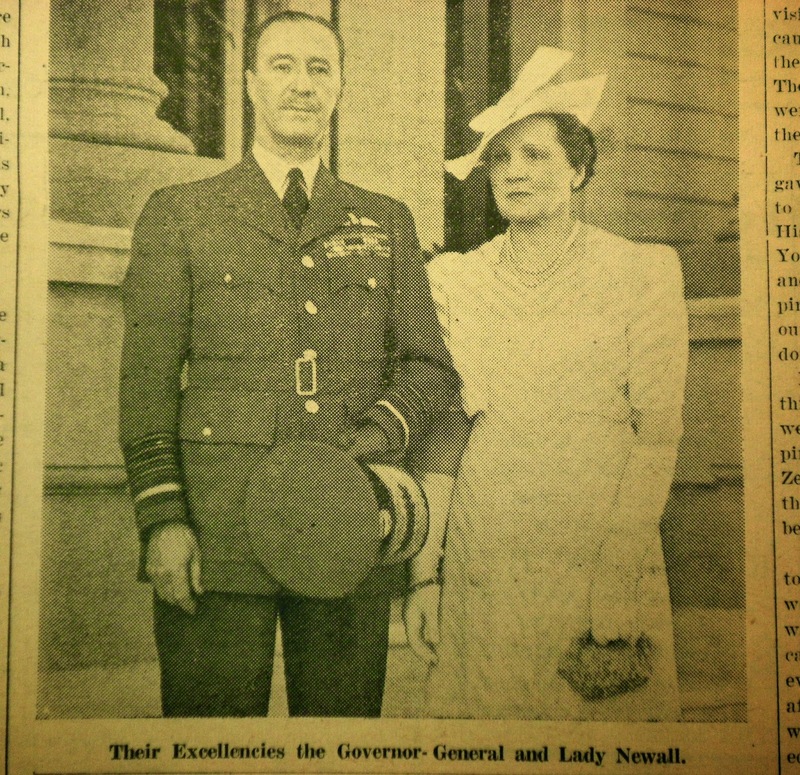 It was timely that 70 years ago, Thames was hosting their first visit by the Governor General Sir Cyril Newall. He spoke of the hard times endured by all and the need to take time to celebrate the reported victories. The entry into Rome of Allied Forces was celebrated in towns around New Zealand. The Governor General was meeting schoolchildren, when the Thames Fire Sirens rang out, along with the sounding of car horns.